Why focus on type 1 interferons in dermatomyositis mechanism? What drives the production of these downstream biomarkers of type 1 interferon signaling in DM muscle? Recent studies suggest a mechanistic role for molecules induced by type 1 interferons in the pathogenesis of some forms of myositis. For dermatomyositis, evidence that these molecules injure myofibers seems especially strong. In the group of disorders known as polymyositis, the study of blood samples suggests a potential role. It is unknown what drives the sustained presence of type 1 interferon-inducible molecules in these diseases, as the type 1 interferons themselves have not been specifically detected along with their downstream biomarkers. Therapeutic development for blockade of IFNα is in progress aided by the identification of blood genomic biomarkers. The inflammatory myopathies - including dermatomyositis (DM), inclusion body myositis, and polymyositis (PM) - are poorly understood autoimmune diseases affecting skeletal muscle. Evidence regarding the significance of type 1 interferons to these diseases, especially DM, is reviewed in the present article, with much of this material recently discussed elsewhere [1, 2]. The type 1 interferons are a class of molecules that include IFNα and IFNβ. After binding to the type 1 interferon receptor (IFNAR) on target cells, these cytokines can stimulate the transcription of a set of genes, the type 1 interferon-inducible genes. Proteins abundantly produced from these genes' transcripts - such as myxovirus resistance protein A, interferon-stimulated gene 15 (ISG15), and 2',5'-oligoadenylate synthetase 1 - remain inside cells. They normally function as defenses against viral infections through a variety of means, such as inhibiting viral transcription, translation, or assembly of viral nucleocapsids. It is possible that the chronic intracellular overproduction of these transcripts and proteins might be directly harmful to cells, such as muscle fibers in myositis . The varied forms of myositis have distinct clinical and pathological features (Figure 1), and probably involve distinct mechanisms of tissue injury. DM, in addition to clinical skin involvement, has two unique pathological features (perifascicular atrophy and endothelial cell tubuloreticular inclusions) that distinguish it from other muscle diseases. Inclusion body myositis has a unique clinical distribution of involvement, with substantial weakness of the quadriceps and wrist and finger flexors, as well as specific suggestive pathological features including rimmed vacuoles. The broad category of PM is mainly distinguished by a collection of otherwise individually nonspecific features. Although frequently lumped together, DM and PM probably involve entirely different mechanisms of tissue injury. Differing pathologies in myositis subtypes. The distribution of immune system cells differs among myositis subtypes. (a) In dermatomyositis, immune system cells are predominantly in the regions of connective tissue that lie between muscle fascicles and include medium-sized and large blood vessels. In (b) inclusion body myositis and (c) polymyositis, immune cells surround myofibers. (d) Especially in inclusion body myositis, these may sometimes invade myofibers. Because type 1 interferons may have many effects on cells of the immune system, they may have roles in the varied immune responses present across multiple myositis subtypes. Yet studies to date suggest that only in DM are these molecules strongly and directly influencing molecular events in muscle. Recognition that cytokines are present in myositis muscle biopsy samples began with immunohistochemical studies for cytokine proteins . This approach is confounded by a number of technical and biological limitations , including nonspecific immunoreactivity, transient expression of cytokines, and their low concentration. For these reasons, some investigators turned to examining cytokine mRNA transcripts in muscle homogenates . Initial PCR-based studies of cytokine transcripts including IFNα and IFNγ generally found no myositis subtype-specific differences compared with nonmyositis muscle - except for granulocyte-macrophage colony-stimulating factor, which was detected in 12 out of 15 myositis samples but in none out of 10 controls . Many subsequent studies of cytokine transcripts and proteins (discussed in [7–9]) have reported variable and often conflicting results. Because of the potential for transient expression and the low concentration of cytokines, downstream persisting effects of cytokines have been sought. Two types of biomarkers (macromolecular and molecular) provide strong evidence that DM muscle has experienced strong signaling of the type 1 interferon receptor. More than 25 years ago, tubuloreticular inclusions (also known as lupus inclusions) - macromolecular structures commonly visible with electron microscopy in DM muscle endothelial cells [10, 11] and rarely seen in other forms of myositis - were recognized as downstream markers of type 1 interferon signaling. Tubuloreticular inclusions in circulating blood cells develop in patients treated with IFNα [12, 13] and those in cultured endothelial cells and other cells develop directly in response to IFNα and IFNβ [14–16], but not IFNγ . For uncertain reasons, no PubMed indexed publication made a connection between this tubuloreticular inclusion literature and DM over 20 years . Over the past 8 years the marked overproduction of type 1 interferon-inducible transcripts and proteins in muscle has been found to be remarkably unique to DM in comparison with all other muscle diseases studied [2, 18, 19]. Microarray gene expression studies of muscle biopsy specimens measuring approximately 18,000 transcripts in each of 113 muscle biopsy samples from patients with a wide range of myopathies showed that only DM samples with perifascicular atrophy have marked elevation of type 1 interferon-inducible transcripts (Figure 2a) . In analyses combining publicly available data, the remarkable specificity of these transcript abundances for DM is impressive. For example, the transcript for the type 1 interferon-inducible gene ISG15 was higher in muscle in all 28 biopsies from adults with DM and perifascicular atrophy and from children with juvenile DM than in every one of 199 non-DM biopsy samples from a wide range of neuromuscular diseases (Figure 2b). Genomic identification of type 1 interferon-inducible pathway activation in dermatomyositis muscle. (a) Analysis of 22,283 gene transcript probe sets (4,904 shown after filtering; one per row) in 113 muscle biopsy samples (one per column) disclosed a cluster of type 1 interferon-inducible genes specifically and highly upregulated in dermatomyositis (DM) with perifascicular atrophy (PFA) (thin red stripe marked by an arrow). Enlargement of this arrowed region shown on the right. Red and green indicate high and low expression. IBM, inclusion body myositis; Myo, myopathies; PM, polymyositis. 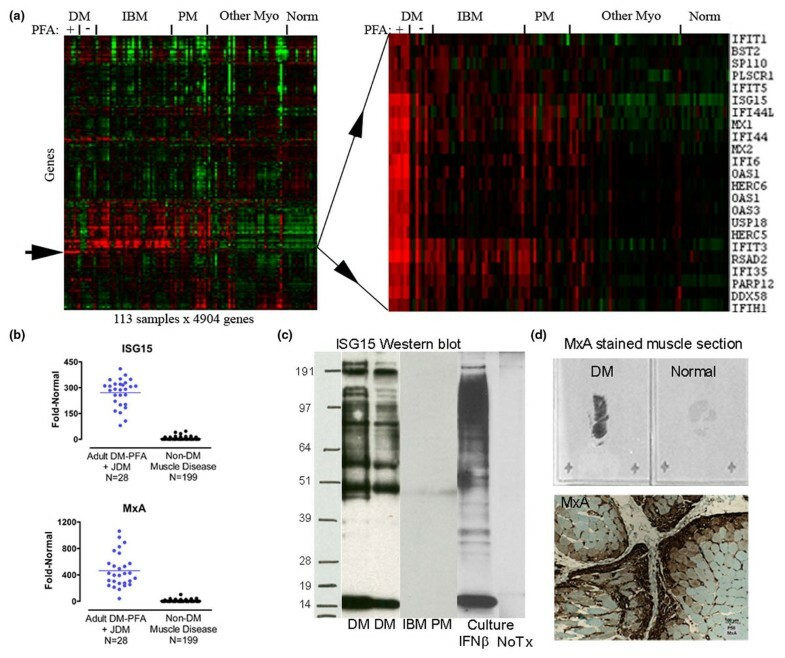 (b) High expression of transcripts for interferon-stimulated gene 15 (ISG15) and myxovirus resistance protein A (MxA) are extraordinarily specific to DM muscle. JDM, juvenile DM. (c) Examples of ISG15 western blots show free ISG15 (approximately 15 kDa band) and multiple ISG15 conjugated proteins (discrete bands and smear shown at higher molecular weights) in DM but not other muscle biopsy samples. Cultured human skeletal muscle cells exposed to IFNβ develop the same pattern of free and conjugated ISG15 as occurs in DM. NoTx, no treatment. (d) MxA staining of DM muscle is sometimes so impressive that it is evident on glass slides viewed without the aid of a microscope. MxA is preferentially located in perifascicular myofibers and in blood vessel walls. Adapted from  with permission. Two type 1 interferon-inducible proteins have similarly been shown to be highly specific biomarkers of DM muscle. Myxovirus resistance protein A is impressively and uniquely (in comparison with other muscle diseases) abundant in DM myofibers with perifascicular atrophy and in DM capillaries (Figure 3) . ISG15, a ubiquitinlike modifier, is furthermore attached to many other proteins in DM muscle, the identities of which have not been determined (Figure 2c). Exposure of human skeletal muscle cell cultures to IFNα or IFNβ produces a similar picture of ISG15 conjugation present in human DM samples (Figure 2c) . Myxovirus resistance protein A expression in dermatomyositis muscle. 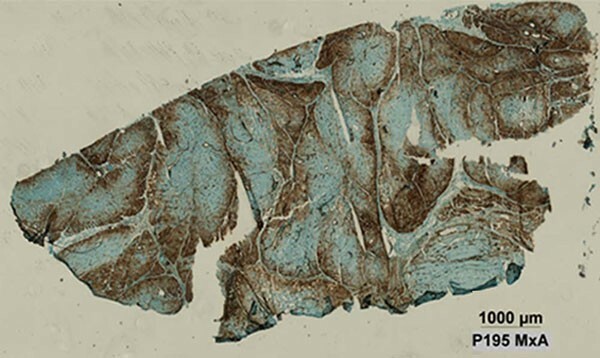 Image of whole muscle section stained for myxovirus resistance protein A (MxA) showing abundant myofiber protein expression (brown) preferentially in a perifascicular distribution. Adapted from  with permission. DM is a systemic disease, involving muscle, skin, and, variably, other tissues. Skin gene expression profiling, reported only in abstract format to date , has similarly shown marked abundance of type 1 interferon-inducible transcripts. The topology of keratinocyte injury in DM skin is similar to that of myofiber injury in DM muscle . Patients with dermatological features of DM who lack significant clinical evidence of muscle involvement have been classified as clinically amyopathic DM. Autoantibodies to a classic type 1 interferon-inducible protein IFIH1 (interferon induced with helicase C domain; also called MDA-5) have been recently identified . Using optimized cutoff values in an ELISA assay, the presence of anti-IFIH1 antibodies in clinically amyopathic DM among 262 patients with a range of connective tissue diseases was 69% sensitive and 99.6% specific. Significant anti-IFIH1 autoantibody levels were present in 22 out of 32 patients with clinically amyopathic DM, but only in one of 35 patients with classic DM and in none of 53 patients with PM. These remarkably strong data both indicate a clinically valuable biomarker of clinically amyopathic DM and provide mechanistic evidence for some abnormality related to type 1 interferons in clinically amyopathic DM. The nature of this relationship is uncertain; one speculation is that IFIH1, a nuclear RNA helicase, is overproduced or altered in some way in clinically amyopathic DM, and evokes an autoantibody response. Blood gene expression profiling has also demonstrated marked abundance of these transcripts in patients with active DM, such as untreated patients, but also in PM (see below) . One study that did not find marked type 1 interferon-inducible transcript abundance in DM blood samples had included almost only treated patients (11 out of 12 patients receiving prednisone; eight of these patients receiving an additional second immunosuppressant agent) . Microarray experiments measure the abundance of 10,000s of transcripts simultaneously; any set of transcripts may be called a signature, but what is impressive about such experiments in DM and PM blood samples is the dominance of these gene expression patterns by type 1 interferon-inducible genes. In a study of 23 patients with DM and PM, at least 24 of the highest expressed 25 genes among approximately 38,000 genes studied are all known to be highly inducible by type 1 interferons . The type 1 interferon-inducible transcript overproduction in DM and PM is highly correlated, within individual patients, with clinical measures of disease activity  (Figure 4 and unpublished data). Although the absolute magnitude of the upregulation of this signature does not highly correlate with disease severity across patients, within individual patients the signature does track disease activity - a situation similar to the commonly used clinical biomarker creatine kinase. Blood type 1 interferon-inducible gene expression correlation with disease activity. 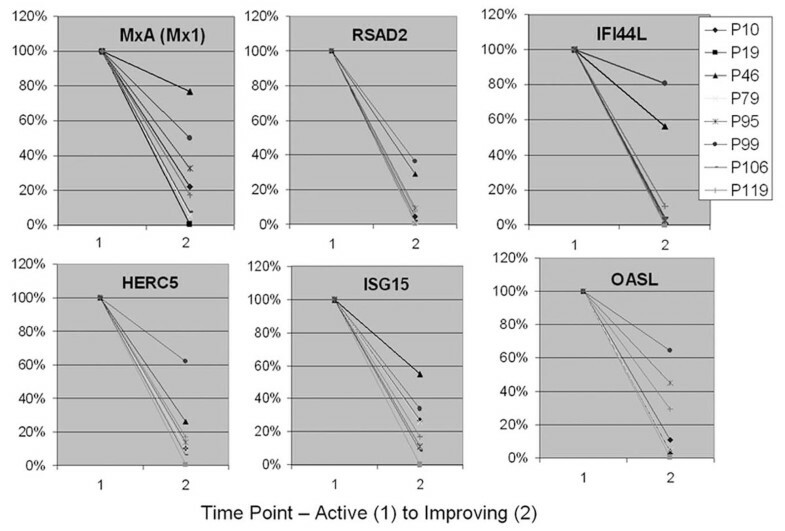 Downregulation of six type 1 interferon inducible genes in eight patients, correlating with improvement in clinical disease from time point 1 (active) to time point 2 (improving). Adapted from  with permission. A fundamental question that has not been answered is what drives the production of type 1 interferon-inducible molecules in DM muscle. Specific elevation of type 1 interferon transcripts or proteins has not been demonstrated in DM muscle. Both microarray and real-time quantitative PCR do not show impressive differences, compared with other myositis samples, in transcripts encoding a range of IFNα subtypes or IFNβ in the same DM muscle samples that have marked upregulation (10-fold to 100-fold) of downstream type 1 interferon-inducible transcripts (unpublished data). 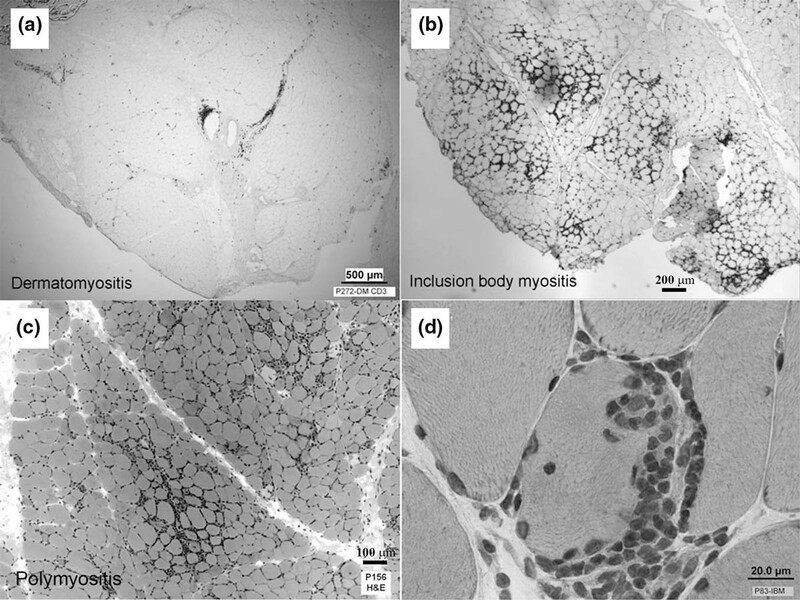 Immunoblots from myositis samples similarly do not appear to show differential presence of IFNα or IFNβ protein in DM muscle (preliminary unpublished data). This situation parallels that seen in systemic lupus erythematosus. Although studies performed almost 30 years ago detected molecules believed to be IFNα in 60 to 76% of systemic lupus erythematosus blood samples using functional antiviral assays sometimes in combination with neutralizing antibodies [24–27], the literature has been notable for the absence of detection of IFNα in systemic lupus erythematosus blood or tissue samples by direct methods such as ELISA, immunoblot, or mass spectrometry. For example, one study found measurable levels of IFNα protein by ELISA in only two out of 38 patients, while most of these same 38 samples showed marked increases in type 1 interferon-inducible transcripts . The lack of direct detection of IFNα protein has been attributed to potential technical limitations, although unexpected results in science have often been assumed to be erroneous. A more recent functional assay looking at type 1 interferon-inducible transcription has similarly detected activity in systemic lupus erythematosus plasma . The interpretation of the results of functional assays is complicated by potential type 1 interferon autocrine mechanisms. In mouse cells, autostimulation of the IFNAR by early secreted type 1 interferons results in marked amplification of IFNα production [30–33]. Anti-IFNα antibodies used in functional assays to neutralize sample IFNα could potentially diminish type 1 interferon-inducible gene transcription through neutralizing early secreted reporter cell IFNα, although this possibility is speculative. For juvenile DM, the functional assay for gene transcription has been used for detection of serum type 1 interferon-inducing activity and similarly interpreted as indicating the presence of IFNα in some blood samples . What is particularly remarkable about this study was the marked range of interferon-inducing activity of serum from healthy children and adults, which varies by over 100-fold and includes many healthy people whose activity exceeded the mean value for the juvenile DM population. These data suggest that the marked production of type 1 interferon-inducible transcripts and proteins in DM muscle, probably by myofibers, might result from sustained activation of the type 1 interferon receptor IFNAR in the absence of excessive (compared with the wide range of normal) type 1 interferons, or through mechanisms even further downstream that bypass IFNAR. The most natural interpretation of the data to date suggests that what may turn out to be most crucial with regard to DM myofiber injury is not the abundance of a type 1 interferon, but rather sustained abnormal function of the IFNAR or a further downstream process. PM is an umbrella term for patients with various forms of myositis that are difficult to classify. DM and PM have substantial differences with regard to abundance of type 1 interferon-inducible molecules in muscle biopsy samples (Figure 5), yet marked overexpression of type 1 interferon-inducible genes has also been found in blood in PM . Within PM muscle, inflammatory cells typically surround, displace, and sometimes invade muscle fibers. These cells include T cells, myeloid dendritic cells, macrophages, and plasma cells (reviewed in ). Type 1 interferons have multiple effects on these cell types, and it is possible that through these effects the type 1 interferon system is contributing to PM myofiber injury. Distinct muscle expression of type 1 interferon-inducible genes in inflammatory myopathies. 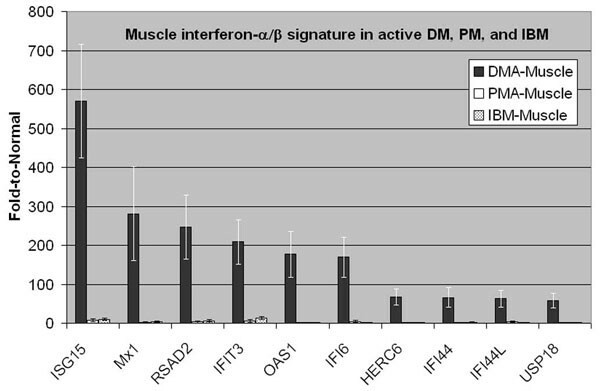 Distinct muscle expression of type 1 interferon-inducible genes in dermatomyositis (DM) compared with polymyositis (PM) and inclusion body myositis (IBM). Muscle microarray data shown for 20 patients (five each with active dermatomyositis (DMA), active polymyositis (PMA), untreated IBM, and normal) with plotted mean values and error bars for mean ± standard error for each group. Highly expressed genes in DM muscle are orders of magnitude greater than in PM and IBM. Adapted from  with permission. Patients with inclusion body myositis - a highly inflammatory disorder of muscle, as judged by abundance of immune system cells and transcripts in muscle - do not have high levels of muscle or blood type 1 interferon-inducible transcripts (Figure 5), although a small proportion of patients may have modest elevation of such transcripts in blood alone. As in PM, the mechanistic interpretation of blood expression of these transcripts is uncertain, and could reflect less-specific effects driving immune cell development. TNFα appears to have an antagonistic relationship with type 1 interferons . It may directly inhibit the generation of plasmacytoid dendritic cells from progenitor cells and may inhibit plasmacytoid dendritic cell production of type 1 interferons. Studies of etanercept in Sjogren's syndrome indeed showed that this drug increased type 1 interferon activity . Accordingly, models that propose a significant role for type 1 interferons in the pathogenesis of myositis predict that TNFα inhibition might exacerbate myositis. Published experience with TNFα inhibition in patients with myositis appears to support this model. Two open-label studies of infliximab have been terminated before completion or had substantial dropout rates for reasons that included disease progression [37, 38]. Although this class of drugs may prove useful in the management of some patients, currently it appears unlikely to be of more general use for myositis. The presence of marked overproduction of type 1 interferon-inducible transcripts in blood specimens from patients with active DM and PM has potential for diagnostic use . These biomarkers may be able to distinguish these disorders from inclusion body myositis and other muscle diseases that sometimes present diagnostic uncertainty. Furthermore, they may be useful for therapeutic development. A phase 1b trial of anti-IFNα therapy has been initiated in DM and PM . Entry criteria into this study include the presence of sufficiently high type 1 interferon-inducible gene expression in blood. Future studies targeting the IFNAR or further downstream events have strong rationale in DM, and perhaps in PM. The present work was supported by grants to SAG from the National Institutes of Health (R01NS43471 and R21NS057225), the Muscular Dystrophy Association (MDA3878), and MedImmune, LLC. SAG has worked as a consultant regarding clinical trial planning for MedImmune, LLC and has a Sponsored Research Agreement with MedImmune, LLC. SAG is an inventor of intellectual property pertaining to myositis diagnostics. SAG has National Institutes of Health funding and the publication of articles constitutes evidence of productivity that may be used to support future requests for National Institutes of Health funding.